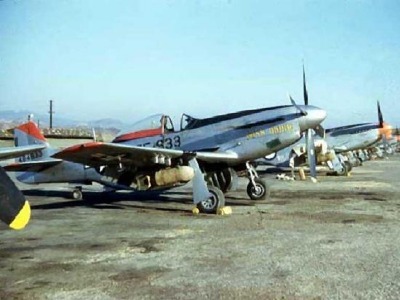 On this page you will find details on the use of the F-51D Mustang as Fighter Bomber and the RF-51D as Tactical Reconnaissance plane during the Korean War 1950 - 1953. 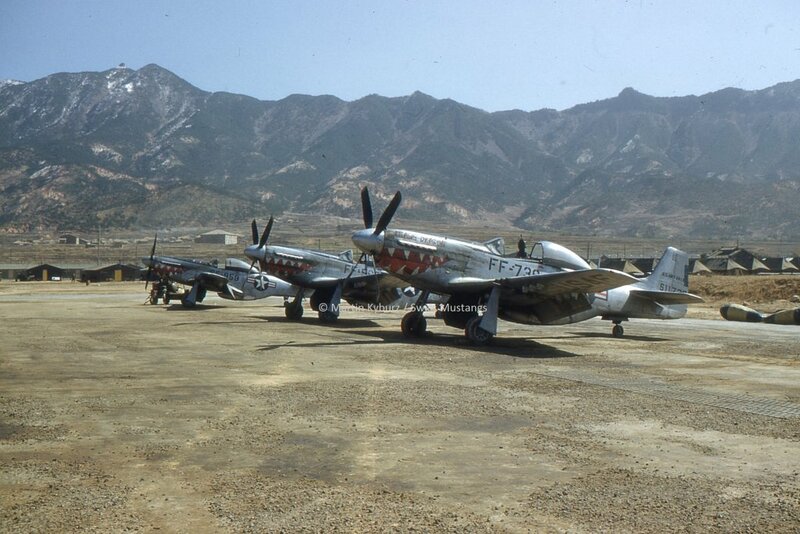 F-51D Mustangs of the 18th FBG 12th FBS ready for action. 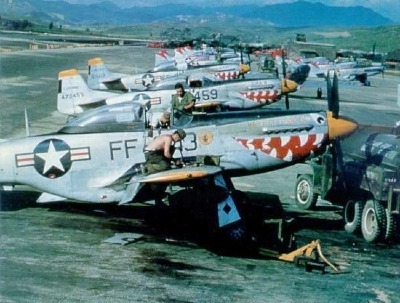 The 12th FBS adorned all their aircraft with a sharkmouth on the cowlings. 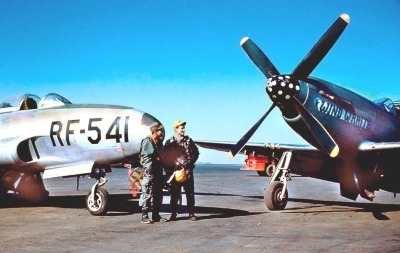 The 2nd aircraft in line is F-51D-25-NA 44-73459, nicknamed "Kay Baby" [port side] and "Gika II" [starboard side]; it was transferred on 15th February 1954 to the ROKAF, but was lost in a training accident only a few weeks later on 22nd April 1954. USAAF and SAAF F-51's bombed up. 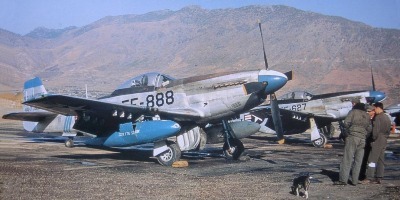 The nearest aircraft is F-51D-25-NT 44-84633 of the 18th FBG 67th FBS, the next in line was attached to No. 2 Sqdn. SAAF "Flying Cheetahs", a unit operationally attached to the 18th FBG. 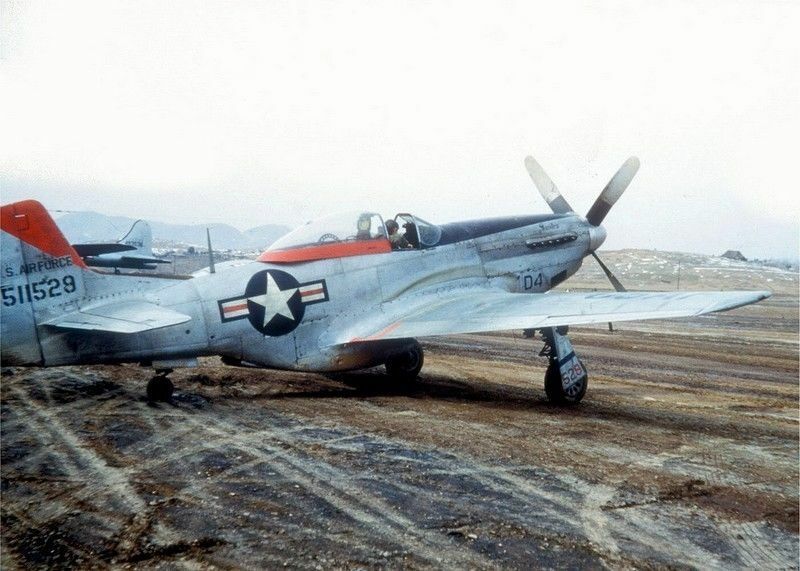 A F-51D-25-NA of the 18th FBG 67th FBS - it is serial # 44-73000 which led to the rare buzz-code FF-000; this aircraft later was transferred to the ROKAF (Korean AF) on 27th April 1953 and was still on strenght in 1957 (USAF). Although of poor quality, this photo shows another aircraft of the 18th FBG 67th FBS with the rare buzz-code FF-000, this time it is F-51D-30-NA 44-75000. 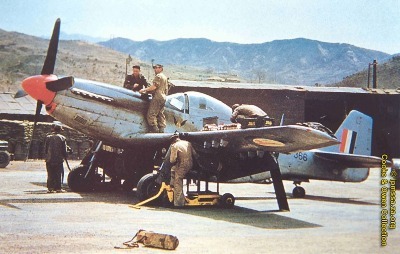 It was transferred to the ROKAF on 29th October 1953. Nearest aircraft (tail visible only) is F-5D-25-NT 44-84916 which also ended up with the ROKAF; delivery date was 7th November 1952 (USAF). 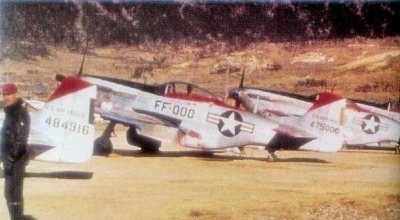 F-51's of the 39th FBS attached to the 18th FBG at Chinhae. Nearest aircraft is 44-73888, buzz-code FF-888, nicknamed "Karin Ann" [port side]. This aircraft was lost on 27th April 1952 to enemy action. Pilots and aircraft of the 45th TRS "Polka Dot Squadron", the only Tactical Recon outfit of the 67th TRG flying camera-equipped RF-51D's until they converted to RF-80 jets (at left in the photo), seen here on New Year's Day 1953 at Kimpo. 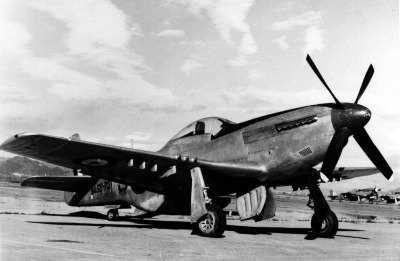 The RF-51D carries the nickname "Wind Wraith" (Lloyd Wooley). 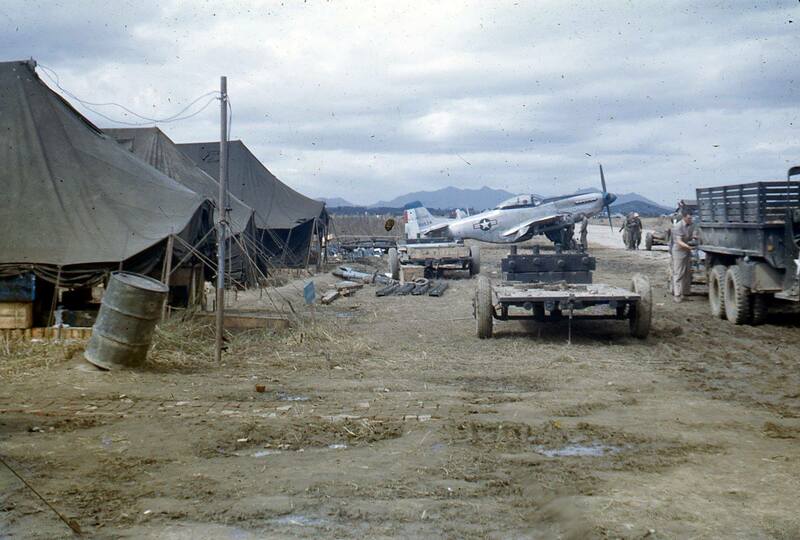 Another RF-51D of the 45th TRS seen here at Kimpo in 1952 - this is 44-84775, buzz-code RF-775, and was nicknamed "Connie" - it survived the hostilities and returned to the U.S. and subsequently served with the 105th TRS TN ANG. 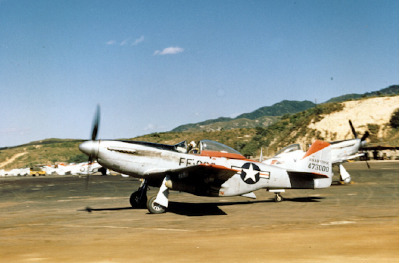 An American pilot returning from a reconnaissance mission in a F-51D Mustang with ROKAF markings. 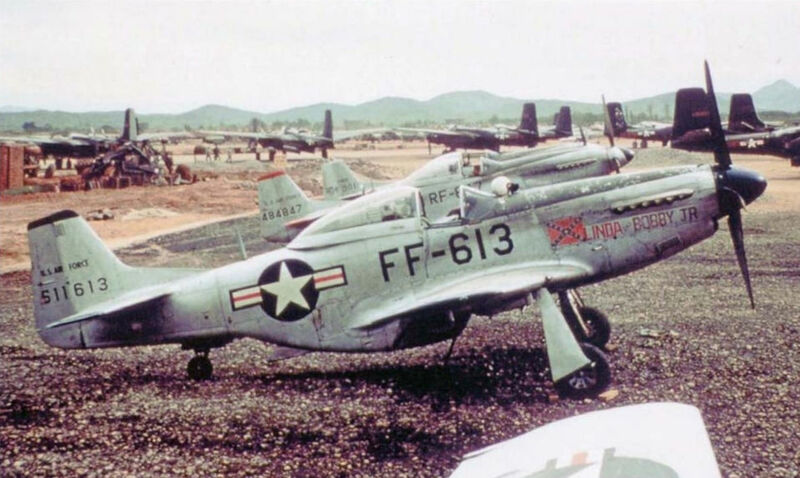 It seem that this is one of the first aircraft handed over to the ROKAF, judging from the hastily overpainted USAF stars-and-bars markings - it was taken from the 12th FBG 67th FBS (John T. Gordon). 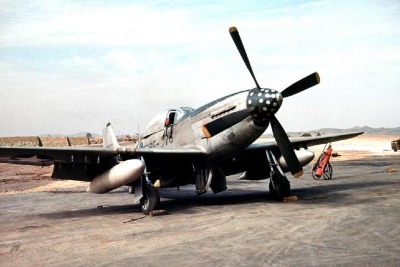 F-51D-30-NT 45-11529 "Sandra" of the 18th FBG 67th FBS - this a/c previously was operated by the 113th FS IN ANG. During a mission on 9th June 1951, this a/c was seen on fire, and subsequently crashed near Taedong River, Kyomipo; the pilot, Capt. 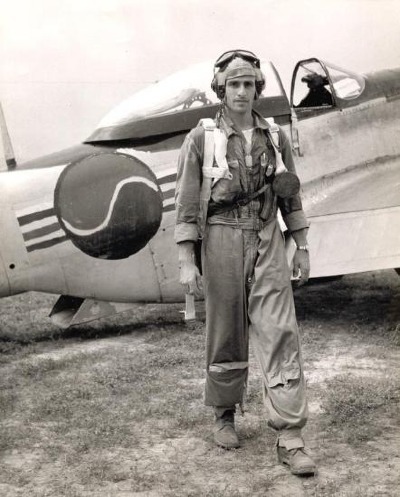 Jack Holly Hederstrom (O-738388) was reported MIA, following an unsuccessful bail-out. 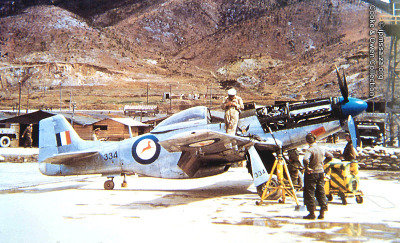 RAAF A68-721 of No. 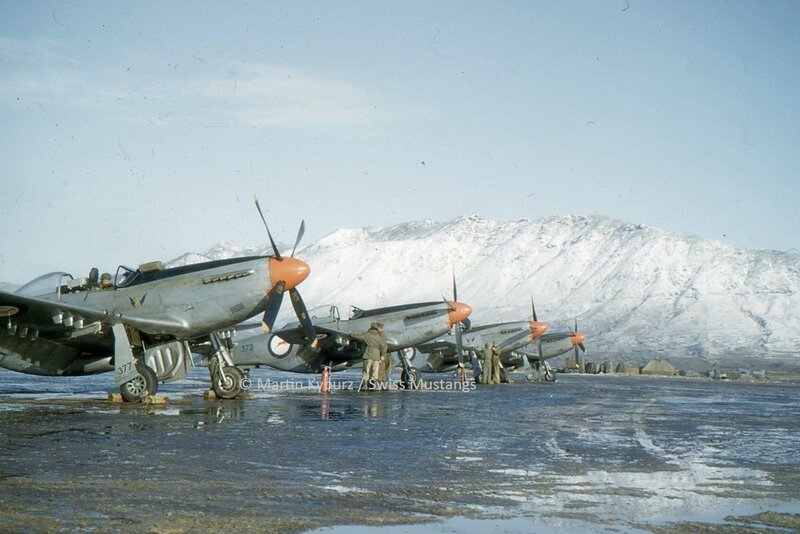 77 Sqdn in Korea.